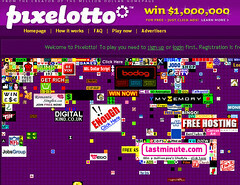 Pixelotto is the latest offering from brightspark Alex Tew who also brought us the Million Dollar Homepage. It was one of the most significant and successful exercises in viral marketing… Tew walked away with a million bucks. Not bad work. Pixelotto has much the same feel and ethos but gives a lucky punter the chance of bagging a million dollars and a donation to charity. Doubtless Tew will turn a shilling too. One to watch. what a clever chap this fella is – undoubtedly his incredibly gifted PR agency have something to do with his success. TurfJam. Its an experiment in the worth of online advertising spaces. TurfJam is an advertising opportunity for marketeers and businesses..
cost of each piece (all are the same size) to see how the price changes over time, and in relation to the number of pieces of turf left. Don’t Forget that Perfect Gift!